An interesting trading system has been developed by Trade Genius. The system generates trades that would be held over a few days to generate small gains with low risk. The software developed by Trade Genius is compatible with Tradestation software as well as some other trading platforms. Beyond the software and philosophy of trading, an interesting spin on the temperature of the planet has “again” shown its face. In an interview with Bob Kudla of Trade Genius posted on YouTube, he discusses the impact of stock prices associated with food over the coming years. His statements are consistent with the content of a book written by John L. Casey, DARK WINTER. 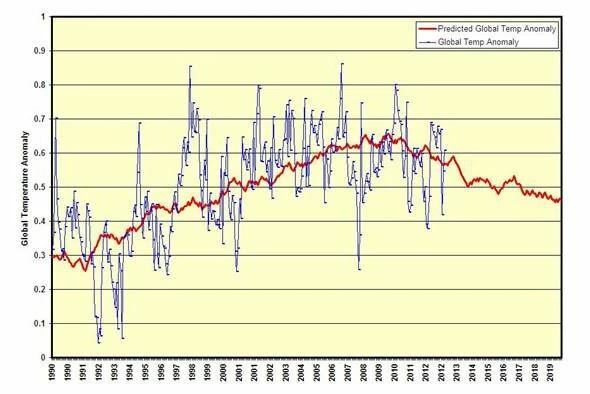 Those statements and conclusions concern a downward trend in global temperatures due to the very high correlation between sunspot activity and global temperatures, in conjunction with the highly consistent pattern of sunspots over time. The above chart shows a correlation of global temperatures to sunspot activity. If these predications hold true, there could well be a disruption in the food supplies around the world. You might choose to stock up on canned goods, or perhaps consider a solution written about in one of my previous blogs, Soylent.